The XC1 is designed to fit common compact carry-type pistols, and among other things it features the company's MaxVision beam, which throws wide, floor-to-ceiling illumination. Twenty years ago, when I was in uniform as a cop, the king of tactical flashlights was Maglite, with Streamlight a distant second. Today, anyone under the age of 30 with an interest in tactical flashlights is aware of Streamlight but probably has never heard of Maglite because the company didn't keep up with changing technology. That can't be said about SureFire. Today, it is the undisputed king of tactical flashlights. In the tactical community there is no greater cachet than being adopted by the U.S. military, and SureFire weapon lights were all over the M4s our troops carried into Iraq and Afghanistan. SureFire has continued to introduce new and improved products as light technology has improved, and most of its efforts lately have been into handheld and handgun-mounted lights. Its latest product is the XC1, and it's getting a lot of attention. SureFire is calling the XC1 an ultra-compact LED pistol light. It is designed to mount on the rail of a handgun and, as its name suggests, is small enough to mount on a compact handgun and not be so heavy or large as to be unwieldy. The XC1 is just 2.375 inches long, 1.1 inches wide, and 0.9 inch tall, which in my book means it's certainly ultra compact and will fit quite nicely on most compact pistols. It's the size of some laser units I've tested, but it sports a 200-lumen LED white light. SureFire says it's the firm's smallest, lightest handgun light, but at the rate the company is inventing new products I think it should add "so far." Constructed of anodized aluminum, the unit weighs just 1.6 ounces without a battery installed. That's roughly the weight of three 9mm rounds—so, no, it's not heavy at all. It wasn't so long ago that getting 200 lumens out of anything handheld was nearly impossible, and the improvement has less to do with batteries than you might think. After all, the XC1 is powered by a standard AAA battery. A lithium AAA battery is included with the light and is advertised as providing an hour of runtime. No, an hour doesn't sound like a long time, but how often will you have the light on, and how long will it be on when you're using it? It's like the last two minutes in an NFL game, which takes at least half an hour to play with timeouts and commercial breaks. Xenon and halogen bulbs are so 1990s. Heck, bulbs are so 1990s, and trust me, you don't want a bulb on a hard-recoiling handgun. Everything in tactical lighting these days is LEDs, and LEDs don't have bulbs in the traditional sense. Cooler running, much more durable and able to emit incredible amounts of light, LEDs are the future—at least until someone invents something better. The XC1's LED sits in a bezel that is 0.375 inch wide. It is on the left side of the unit, with the battery compartment on the right. The "multifaceted" reflector of the light looks a bit like a crystal chandelier inside and provides what SureFire calls its MaxVision beam. In plain English, it means that while the center of the beam is slightly brighter than the outside of the circle, there are no glaring bright spots and there isn't a hard edge on the outside of the projected circle of light. The beam is also amazingly wide. At a distance of five yards the beam's circle is about 10 feet wide. Yes, you read that right. This means the beam of the XC1 is wide enough to illuminate an entire wall, floor to ceiling, from inside the bedroom. One thing I can't stand are tactical flashlights with controls so complicated I need a manual to figure them out. The controls of the XC1 are simple and intuitive. There are toggle switches on either side. If you have more than one slot to choose from on the rail of your handgun, choose the one that positions these switches where they can be reached with the thumb of your support hand (near the front of the trigger guard). Pushing down on either toggle switch will give you momentary activation of the light. If you want the light to stay on, there is a horizontal switch farther up on the body of the light. The constant-on switch is recessed so it is not likely to be accidentally depressed. The only thing I've found I don't like about the light is how tough it is to swap out batteries. The AAA fits snugly inside the unit, and AAA batteries don't weigh much, so when it comes time to replace it, you'll either need to whack the unit (or the handgun it's on) against something hard to dislodge the battery, or use a knife to pry out (with great difficulty) the battery. 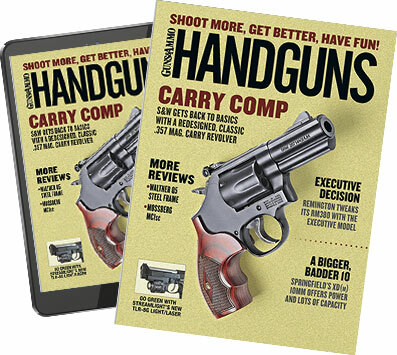 The editor of one of our sister magazines recently told me he likes the XC1 so much he is in the process of buying them to put on all of his carry guns. This confirms in my mind that SureFire has set the modern standard for performance under extreme conditions—and that editors get paid too much. The XC1's performance doesn't come cheap. Suggested retail is $299.